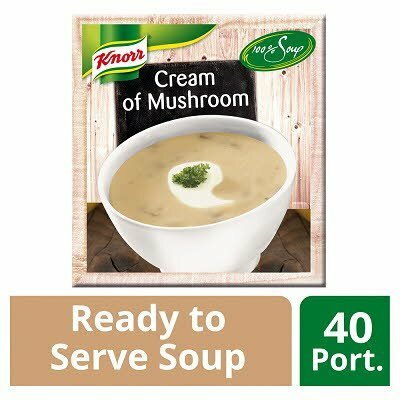 Water, mushrooms (11%), vegetable oil (rapeseed oil), modified corn starch, shallots (1.8%), CREAM (0.6%), salt, EGG yolk, BUTTER oil, yeast extract, mushroom extract, spices (onion powder, white pepper), flavourings [contain CELERY, lactose (MILK)], emulsifier (mono- and diglycerides of fatty acids). ON THE HOB: Open the pouch. Pour contents into the pan, heat product to a minimum temperature of 75°C. Stir from time to time.COMBI-STEAMER OVEN: Pre-heat the combi-steamer oven to 95°C, 100% steam. Place the unopened pouch in a perforated tray suitable for use in the combi-steamer oven. Heat for 30 minutes at max. 95°C, 100% steam. Remove immediately from combi-steamer oven, open & transfer contents to serving unit. Ensure that the temperature of the contents is > 75°C.WATER BATH: Place the unopened pouch into a water bath (95°C). Heat through for 30 minutes. Remove from water bath, open & transfer product to serving unit. Ensure that the temperature of the product is > 75°C.HOLDING THE PRODUCT IN A BAIN MARIE: Product should be held at or above 70°C for a maximum of 4 hours & stirred frequently to ensure even heat distribution. Prepare only the amount needed for one service period & do not add fresh product to older batches. Store in a cool dry place. Once opened refrigerate any unused product and keep for max. 72 hours at max. 7°C.If pouches remain unopened after heating, they can be cooled down to < 10°C (following HACCP rules) and reheated to above > 75°C for use within 24 hours.